Sometimes we overlook the basic building blocks in our field. In this case the four basic stroke types are crucial in understanding the mechanics of how certain rudiments, and hybrid rudiments work. Learning the four basic stroke types can give you a simplified measurement tool for stick heights when executing rudiments, hybrid rudiments, and ghost notes behind the kit. F = Full Stroke (rebound) Starts high, ends high. t = Tap Stroke Starts low, ends low. U = Up Stroke Starts low, ends high. An accent is a stronger attack placed on a particular note or set of notes. Mostly it’s a down stroke which is symbolized by (>) over the top of a note or notes. Use the Stroke Types to set up your hands for the next move on each of these exercises. In this lesson we will be using the accent markers as symbols for either a Full Stroke, or a Down Stroke. 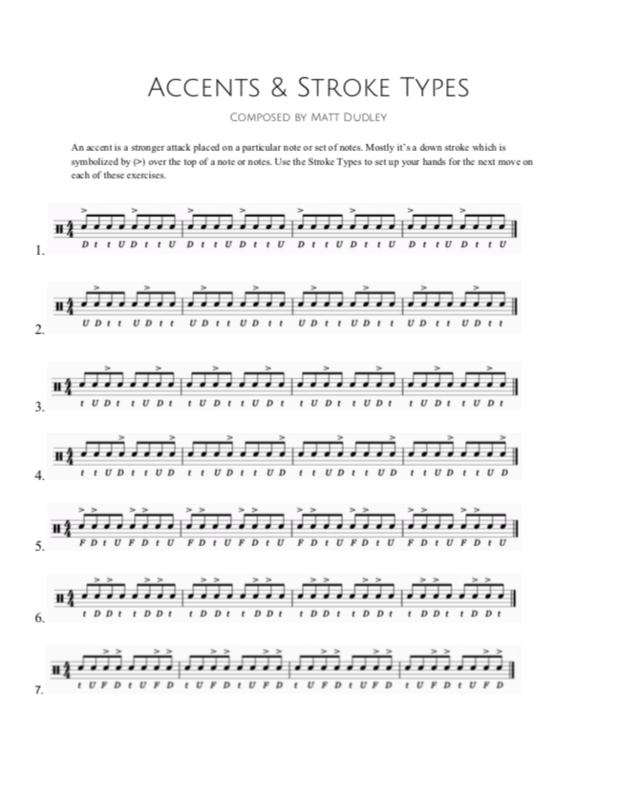 The Accents & Stroke Types PDF provides many exercises that you don’ see here on this post. 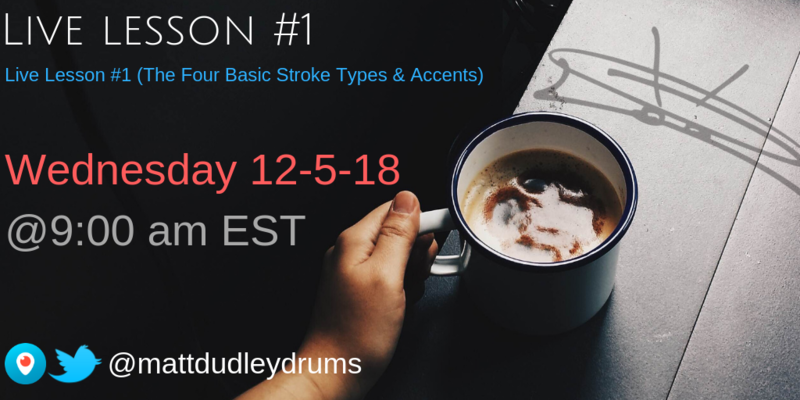 Be sure to download Accents & Stroke Types and follow along with the video to get the most from this lesson series! Hope This Live lesson helps you! Looking forward to doing these every Wednesday and continuing to build relationships through drumming and education! Keep drumming and have fun!